People interested in Australian Folk Music or other aspects of the Australian performing arts may also be interested to know about the National Railway Heritage Conference being held as part of the 150th year celebration of Australian railways. This event is being held in conjunction with a number of cultural activities in Tamworth at the end of September. This festival when established will provide opportunities for performers of railway related material from all over Australia and from other countries. The conference coincides with a number of related events associated with the 150th Celebrations of Australian Railways such as the establishment of the Australian Railway Monument (a memorial to railway employees kill in railway accidents) and railway social history museum at Werris Creek, site of the first specific railway town in NSW. The first stage of this project the will opened on the weekend following the conference with a festival that is expected to become an annual event of railway culture. The Australian railways over the years have had a strong influence on our national culture in general and in particular on folk music, poetry and storytelling. The conference will be looking at how this rich heritage is preserved and continues to play a roll in Australian life in the future. The University of New England's Heritage Futures Research Centre, in organising the conference, aims to assist in facilitating on-going support for the conservation, interpretation and development of this as aspect of Australian culture. The conference will present papers on a variety of aspects of the Australian railway culture and several concerts and exhibitions are planned. The conference also intends to address issues that organisations like yours may have an interest in. For example, much of Australian railway related art and culture is currently scatted from one end of the country to the other. How is this very rich culture to be preserved, particularly in a political and industrial environment that does not value it? Our leading overseas speaker, Professor Colin Dival, from the University of York, will throw some light on this subject. A number of Australian cultural institutions are becoming involved with the conference, such the National Museum, Powerhouse Museum and Australia ICOMOS. 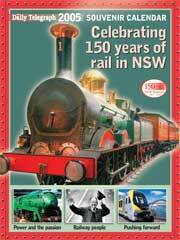 We believe that there needs to be a new Australian approach to preserving railway culture. You may have some ideas of your own about how railway culture should be conserved and appreciated. For example, Australian railway music, that has a strong history over the last 150th years, covers several musical fields that will have to be considered if railway culture is to continue to grow. For further information and enquiries please contact Dr Andrew Piper, Conference Convener on (02) 6773 2764 or by email. Please also visit the conference website.